Over the past week the mercury has crept a little higher and many of our snow piles are gone! So Cheryl and I went for a little walk around the perimeter of the parking lot this afternoon. Before I tell you the results of our search, I thought I would share the results of last week’s poll. You guys have a lot of faith in finding this mitten. 41% told her to not give up, but cast on another one…just to be safe and 35% of you believe she is going to find it! I hope you are right…for her sanity's’ sake. Only a combined total of 14% of you thinks she won’t find it. I am elated to tell you that she found her mitten. And can’t tell you how happy she is. She was doing a little dance and everything. I have to say that it’s in really good shape too. It needs a washing, but other than that it looks great! For once in my life I am happy to say that I was wrong. The winner of the random drawing is Katy! She will be receiving these 2 balls of Liberty Wool Print in the mail shortly! P.S. Cheryl says that although someone else won the giveaway…she’s the one who really won. CEY is honored to have many independent designers contribute designs to our line. Today, Rachel Henry –a local knitter and designer, is here to talk a little about her newest CEY design. For my guest stint on the CEY blog, I thought you, dear reader, might be interested in learning a bit about the design process (or at least, my design process for a particular pattern) by talking about Embry. Embry started out a little different from the gorgeous scoop-neck top in Mesa. My original proposal used a different yarn, had beads, and a completely different neckline. The lace edge and overall shape of the top remain the same, but obviously a lot changed too. The call for Spring/Summer 2014 went out in April of last year. I immediately had several ideas I wanted to submit. Although I was busy with a certain knitting competition at the time, I didn’t want to miss out on the opportunity to design for CEY. I carefully calculated that I would have plenty of time to make one sample and pattern, possibly two, and got to work. 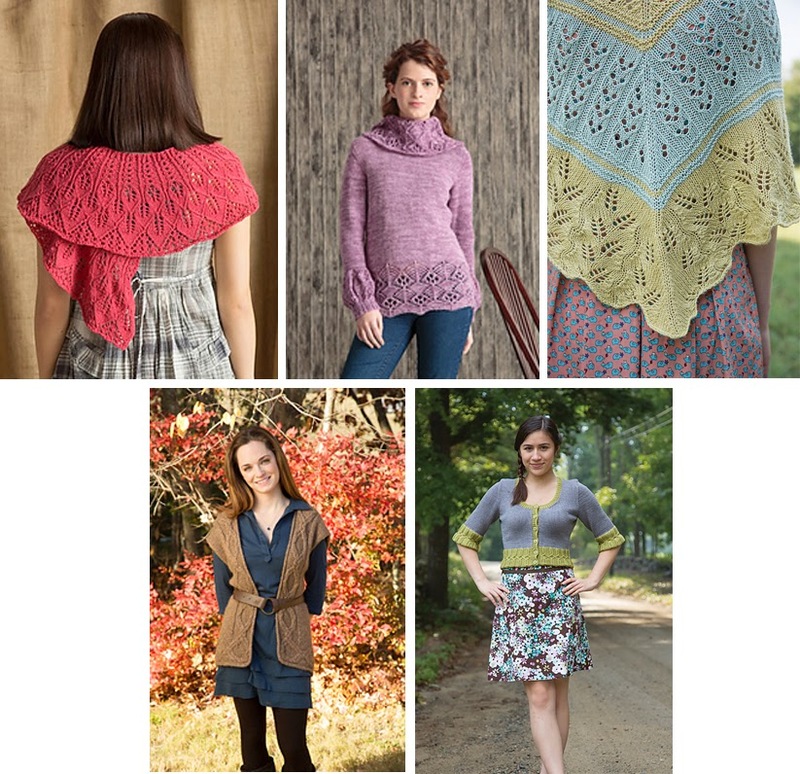 I think Embry was mainly inspired by the phrase “lady-like shapes and embellishments” on the call’s mood board– it made me think of a lace edging from Weldon’s Practical Knitter that I’d seen on Franklin Habit’s blog. I picked up a spare ball of Soft Linen (one of my absolutely favorite yarns) some pretty-shiny beads, and worked up a version of the edging that made me very, very happy. After blocking the swatch, and falling completely in love with it, I wanted to use it all over the entire top! Love, dear reader, is sometimes a wee smidge blind. My sketch for the submission had the lace edging at the hem, the cuffs, AND overlaying a crew neckline. Beads and lace everywhere! 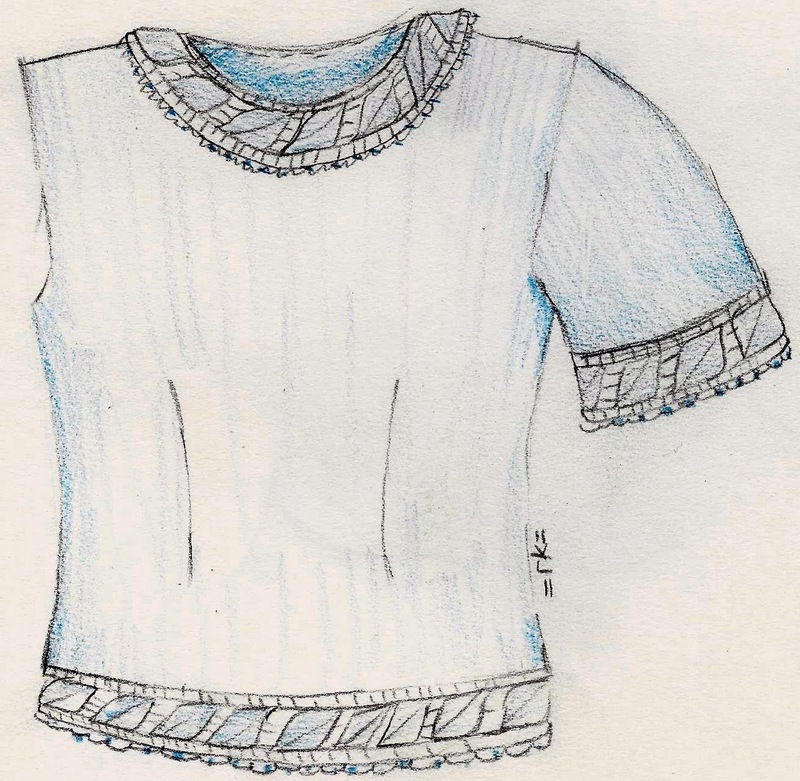 You can see from my sketch that the basic shape of Embry is there – the princess seams in front and back (influenced by Amy Herzog, naturally), the short sleeves, the length of the body. But (let’s be brutally honest), that neckline is a bit much. I sent in my ideas, with a note that the lace-edged tee was my personal favorite. Imagine my delight when it was accepted! The only catch … it was needed in Mesa instead of Soft Linen, and the Creative Director Susan Mills quite rightly requested a plain neckline. Also? No beads. That broke my heart a little bit, but I understood the decision. The chance to re-think the neckline made me lean towards a deep scoop neck (so flattering!). I cleared that final idea and got to work. 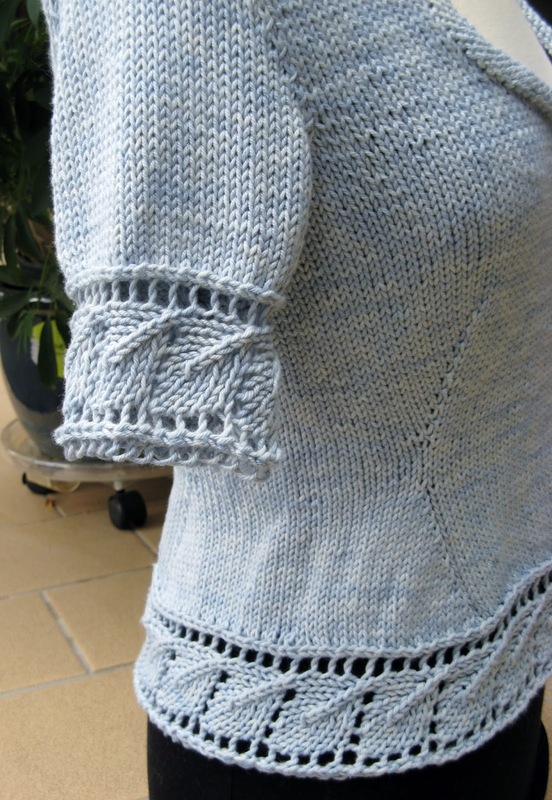 I’d seen a very attractive reverse-stockinette rolled edge recently, and put that in place for Embry’s neckline. The sample worked up quickly and easily. I was extremely happy with the final pattern and sample – I was given a beautiful soft blue (pastel without being anemic), and the sized-up motif looked great in Mesa. Here are is a quick photo on a dress form before handing it in. I really enjoyed designing and making Embry and hope you love it as much as I do! You can keep up with Rachel and all her projects on her blog. 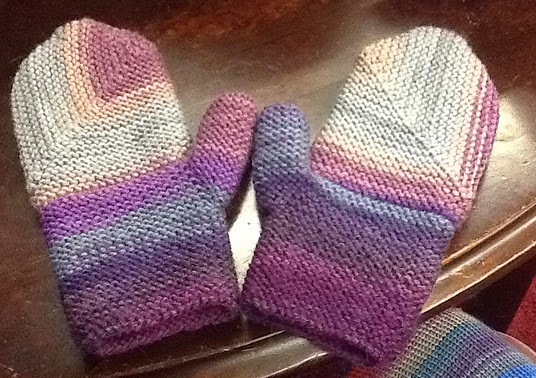 Cheryl, who works in our outlet store, made herself a pair of the Mitered Mittens in Liberty Wool (using color 7834 Lilac Daydream…since I know you are going to ask) in January. She really loved making them. They are knit flat and then sewn together, which was perfect for Cheryl, because she hates knitting in the round on small circumferences. This is also a great pattern for someone making their first pair of mittens. It only takes 2 balls of Liberty Wool Print, so they go really quickly too. Since then she has lost one. (Everyone make a frowny face!) She is SURE she lost it in the parking lot at Classic Elite Yarns during one of our many snow storms this season. She has a theory that somewhere in the piles of snow that the plow guy has made is her poor single mitten. She refuses to make another one…that is how sure she is that she will find the lost mitten. I keep telling her that the chances of her finding the single mitten are slim to none. And that even if she does find it, there is a good chance it will have been damaged by the plow. What do you think? 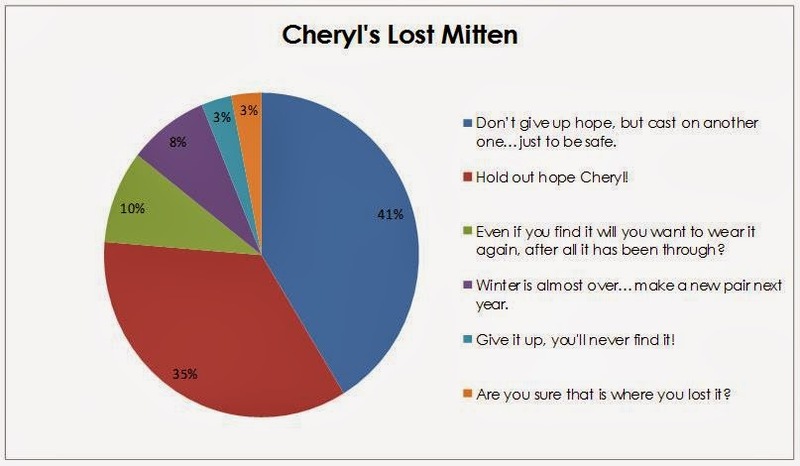 Will Cheryl find her mitten? Or should she just accept it as a loss and make another one? Help Cheryl decide and win 2 balls of Liberty Wool Print a copy of the Mitered Mittens pattern...whether for this winter still, or for next year! Vote now! Please make your selection no later than Tuesday April 1 at 5 PM Eastern Time! Winner will be randomly drawn. P.S. I told Cheryl take NEXT time she should make an i-cord to go through her jacket to connect the mittens, kinda like we had as little kids. That way she can’t lose just one! I am going away this coming weekend to visit some family in Michigan. I am starting to think about what I am going to take with me. Sure, I am thinking about how many days I am going to be there and how many pairs of underwear and socks I am going to need. More importantly…I am starting to think about my knitting and how much yarn to pack. There is a lot of hidden knitting time on a trip, even a short one like that one I am taking. First there is the trip to the airport. I live about 40 minutes from the airport and will be taking a cab. Then there is the time while waiting in the TSA line. And then the time waiting to board the plane. Already I have several hours of knitting…and I haven’t even left the state of Massachusetts yet! Not to mention the time in the air, layover times, the time while I am in MI… and then the entire trip in reverse! A good travel project should be easy, but still a little challenging. Most of us will get bored after hours and hours and hours of garter stitch…but a complex lace or cable pattern with lots of charts isn’t realistic for those small airplane seats (especially if you get stuck in the middle seat). So what I am taking with me? I started this Silky Alpaca Lace scarf a little while back and haven’t made much progress on it. It’s a variation on a simple feather fan stitch, which makes it a no-brainer for a travel project. And one ball of Silky Alpaca Lace goes a long way. But you know I can’t just take one project, right? For my second project I think I am going to take my Nmyphalidea Shawl that I started last week. I have the pattern memorized already. It’s one of those patterns that is simple, but interesting. And although it takes two colors, the Alpaca Sox I am using is light weight and I am willing to carry two skeins around. I’ll probably bring a third project along with me as well…you know…in case I get bored with the other two, or run out of yarn, or don’t feel like working on one of the first two…or whatever. Most likely my third project will be socks. Socks make an excellent choice for travel knitting. There are a lot of stitches on a sock. So most likely they aren’t something I would finish in the time that I am in the air or at my destination. And sock yarn is small and light, which makes it easy to pack. Now I know a bunch of you are worried about what the TSA might say about air travel and knitting. If you are traveling domestically (like I am), there should be no problems. You can check a list of items that the TSA has approved for on board travel on their website. I personally have never had a problem taking my knitting with me, but I always bring a copy of the approved items with me printed from their website the day before I fly or have the website handy on my iPhone. That way if I get questioned, I can pull it out and (in a very nice and soft voice) explain why I brought my knitting with me. Of course the ultimate decision lies in the hands of the individual screener, but since knitting and crocheting is so popular, most screeners already know the rules and even know what knitting needles and crochet hooks look like. I know that rules have changed to say you can take small scissors now, but I always leave mine at home or in my checked bags, just to be sure. If you are traveling internationally, you will want to check with your carrier to see what the laws and rules are for other countries. Some countries are fine with it, others…not so much. Most likely you can knit on the way to your destination (since it is the TSA who will be screening you), but you may want to consider packing your knitting in your suitcase on the way back. I know…that would be a total bummer…but better than having it taken away from you at the airport. And if you can’t knit or crochet on the way back, you can always read a book about it! Are you traveling soon? What knitting/crocheting are you taking with you? Everyone at Classic Elite Yarns is a little shawl crazy. We can’t help it. Not only are we knitters, but there is literally a warehouse full of yarn only a few feet from our desks. And the fact that almost every day there is a new shawl pattern released via the internet doesn't help. 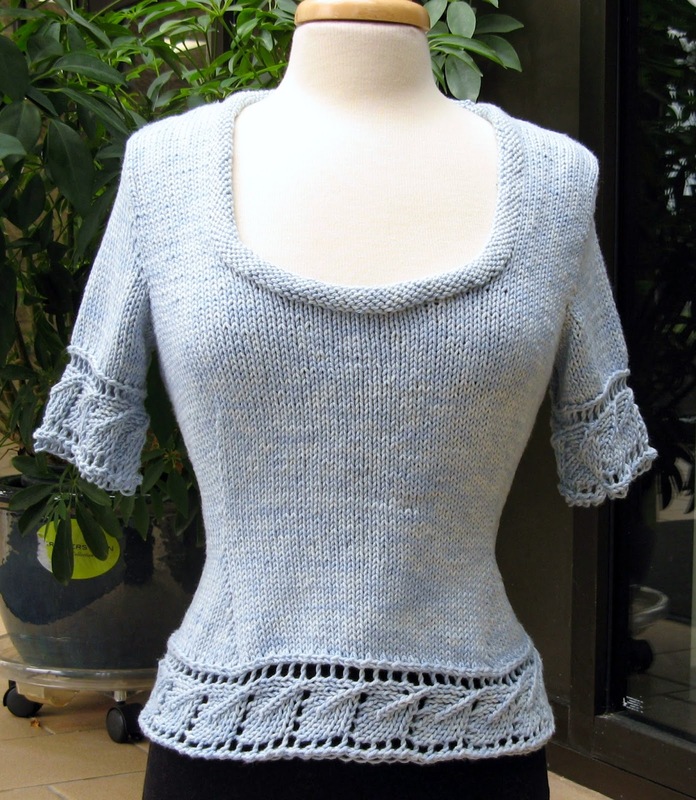 The one that we all seem to be obsessed with (this week, anyway) is Nymphalidea by Melinda VerMeer from Knitty Deep Fall 2013. It all started with a good friend of ours, Jane. She knit the shawl using 1 ball of Liberty Wool Light Print (color 6698 Blue Twilight) and 1 ball of Liberty Wool Light Solid (color 6617 Brick). And we all just fell in love with it. Shortly thereafter Betsy went on a trip and needed some good airplane knitting. You know…simple enough to memorize the pattern, but not so simple that she would be bored. That’s when she had the idea to make the same shawl out of the same yarn, but in different colors (she used LWLP 6606 Reflecting Pool and LWLS 6615 Bright Olive). As I was writing this post Diane, another friend of CEY, came in to visit. And what had she just finished? A Nymphalidea of course! She also used Liberty Wool Light for her print. But for her solid she used Soft Linen. Genius! 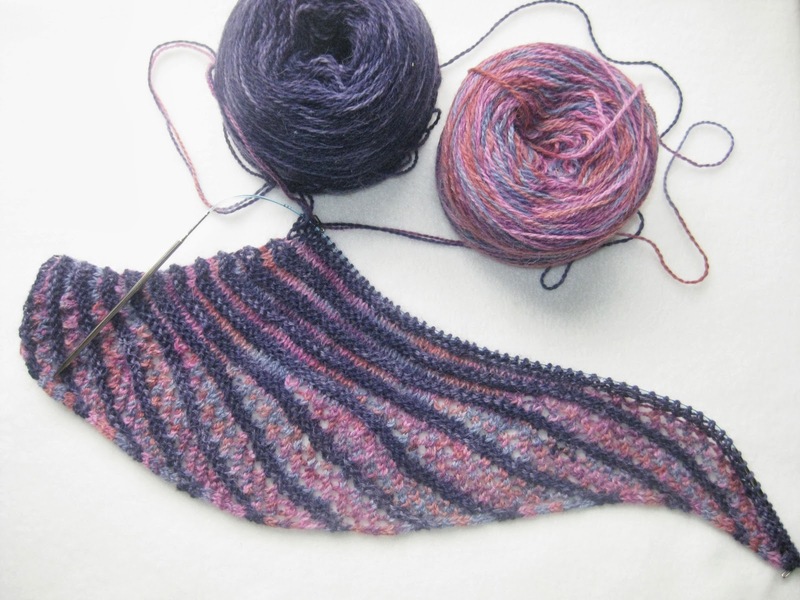 And the way she used the color of the Liberty Wool to make a gradient shawl is stunning. Truly beautiful! Now I have the bug. But instead of using Liberty Wool Light, I decided to use some Alpaca Sox that I had in my stash (you know it’s for more than just socks, right?). I already had a skein of 1853 Pastel Pizzazz, but needed a solid to go with it. At first I tried 1828 Charcoal, but I decided it was too dark. So I soon as I came into work the other day I raced to the shelves to see what I could find. I settled on 1895 Byantine Purple and I think it is going to work much better. What do you think? I like my shawls a little bigger, so I am going to keep going until I have a size I like, which the larger skeins of the Alpaca Sox will allow me to do…it has a generous 450 yards on a hank. Between the Liberty Wool Light Prints and Solids and the Alpaca Sox Handpaints and Kettle Dyed there are a TON of possible combinations for this shawl. I even think 2 colors of Alpaca Sox in Kettle Dyed would be really awesome (I am thinking 1880 Wasabi and 1807 Viridis personally). 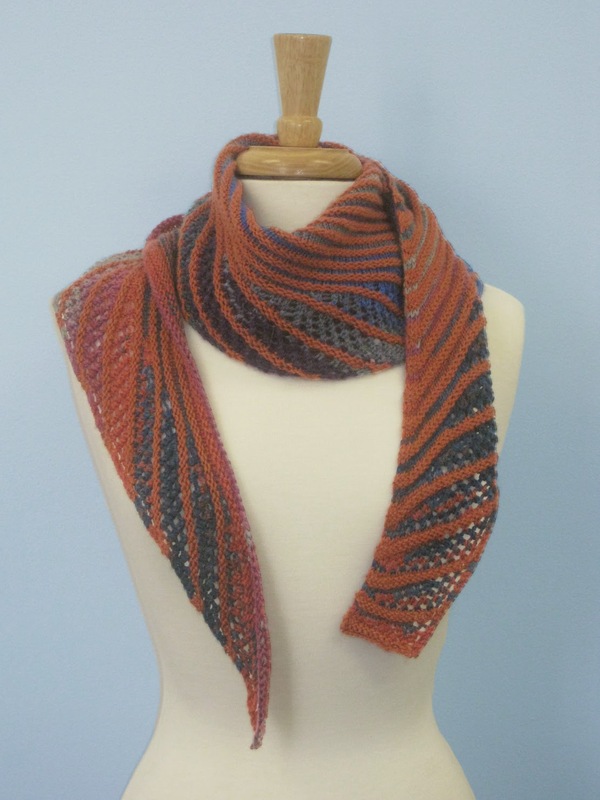 What if you love the shawl, but want something in a lighter weight yarn? Silky Alpaca Lace has lots of hand painted colors and solids that coordinate back to each other. 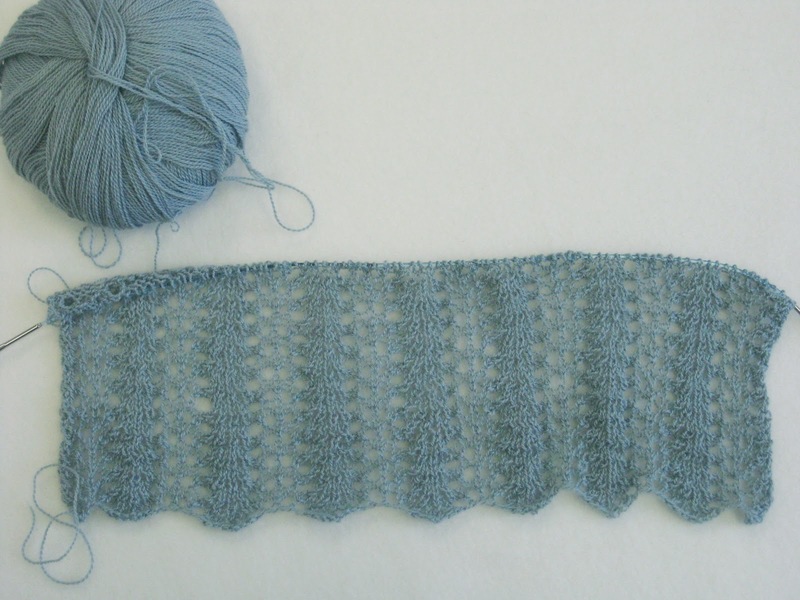 And because of the way the pattern is written (starting at one point and increasing until you either run out of yarn, your shawl is big enough, or you are ready to move onto another project) it is super easy to adjust your gauge. Another great option would be two colors of Firefly. 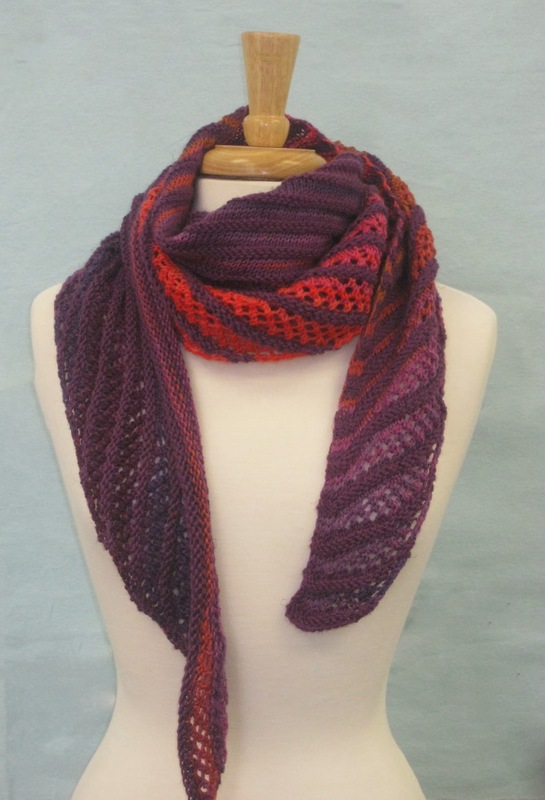 Firefly has amazing drape and sheen to it and would make a great summer accessory. Are you as shawl crazy as we are? P.S. 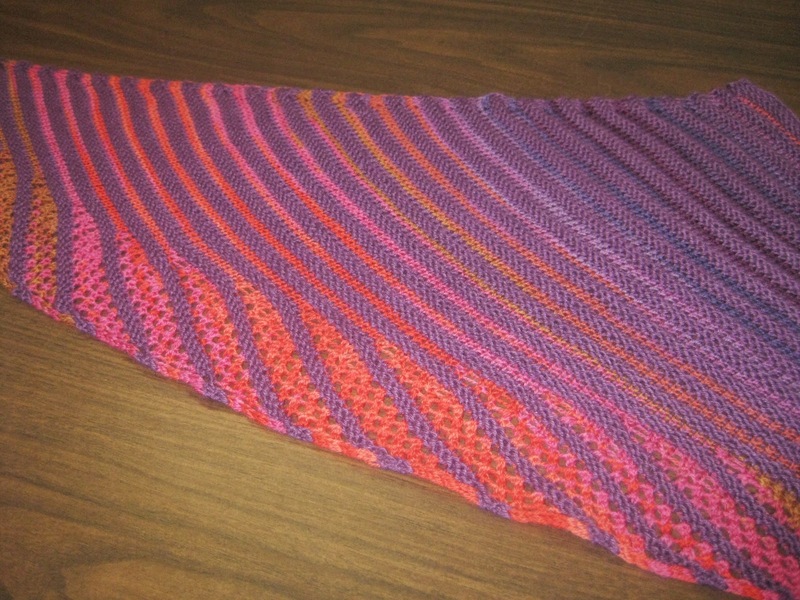 Now I just need to figure out how to pronounce the name of this shawl! Spring is one of my favorite seasons. And perhaps it is for this reason that it seems too short to me. I look forward to the croci that will soon be popping out of the ground and the sweet smell of lilac, longer days and warmer temperatures. But most of all, after a long winter (and we all know how long this winter has been), I look forward to shedding my layers. No more tights, heavy socks and sweaters, but instead lightweight garments that drape and flow. No matter the season…I am a cardigan girl. Always have, always will be (in fact I am wearing a cardigan as I type this). They are a great way to add a layer of warm (if needed), add a pop of color, or change an outfit entirely. 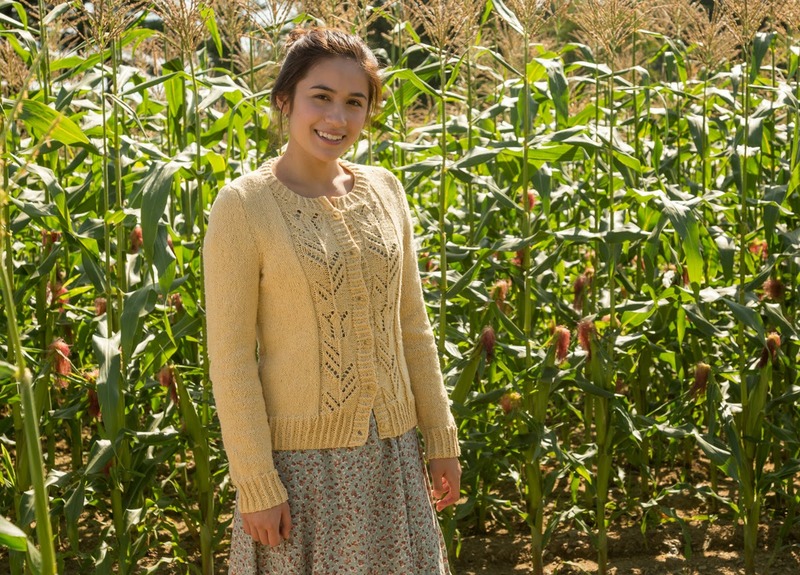 There are three great cardigans to choose from in our latest book, Homestead. The first is Cassidy by Deborah Helmke. This is such a great layering piece. Knit in Soft Linen, it is the perfect blend of fibers for a spring cardigan…it will keep you warm on those cooler days, but will still be cool enough to wear into the air conditioned days that are soon to follow. The lace detail on the fronts and sleeves of this cardigan are simple to work, but not too boring either. The scoop neck is such a flattering line on many women and the ¾ sleeves are perfect for a spring cardigan. The second cardigan is Maisie by Tonia Barry. I love the vintage vibe that this cardigan has going on. It’s like the piece that you are always searching for in your favorite vintage store, but can never seem to find. Since you can never seem to find it, why not knit one for yourself? Knit in Classic Silk the lace motifs on the fronts remind me of the spring flowers that will soon be pushing up out of the ground. It has waist shaping, long set-in sleeves and a classic crew neck. Button it up over your favorite dress or wear open over a tee. Either way, you can’t go wrong. The last cardigan in the book is the one you will be reaching for over and over and over again. Cheyenne is a simple open front cardigan in Meadowlark (our newest yarn), also designed by Tonia Barry. Knit in one piece to the armholes it is a fast knit, with little finishing. The mostly stockinette piece showcases the tweedy texture of the yarn, while the knit below rib gives it an added bit of interest and just the right amount of finishing. Fair warning – Meadowlark is in short supply for a little while. When you find it, scoop it up before someone else gets it first! Now the biggest question (for me at least), is which of these cardigans am I going to knit first? Jil Eaton has been a longtime friend of Classic Elite Yarns, lending her name and fabulous designs to the Minnowmerino and CottonTail lines. She is known for her bright colors and timeless children’s designs and has written over 10 books on knitting including All Dressed Up, ParkAvenue Kids and Knitting School. Additionally she is the author of a column in Knit Simple called ‘Ask Jil’, where she helps readers with their ‘needling’ questions about knitting. She recently redesigned her website and has been busy adding her patterns to the Ravelry database. In celebration, this week’s web letter is a republication of a pattern that originally appeared in the Fall 2010 Knit Simple. 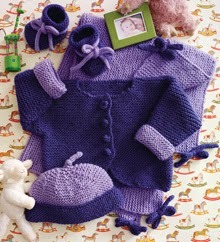 A beautiful baby layette using 2 colors of her signature yarn MinnowMerino. We are only able to offer this pattern for a limited time, so make sure you download your copy today! I sat down with Jil to ask her about her knitting and everything she is juggling at the moment. CEY: How long have you been knitting? Who taught you to knit? Jil: I’ve been knitting since I was 4 years old, taught by my beautiful young mother. We recently found a trunk full of my earliest creations, sweaters and coats and pantaloons…quite a few holes here and there, but pretty cute just the same. I even tried to knit an 8 armed sweater for my stuffed octopus! CEY: You studied design at the Graduate School of Design. Tell us about that. Jil: I studied Landscape Architecture at the GSD. I think the principles of design are inherently the same no matter the practice….color, shape form, balance and creativity reign. CEY: Did you ever knit during lectures while at GSD? CEY: When did you start designing knitwear? Jil: I guess in kindergarten, but seriously when my son was born. At that time the only patterns available were in soft pastels on size 3 needles. I made one sweater and realized he’d be in college before I finished another one. SO I made my own designs in bright colors and bulkier yarns, and voila, my business was born as well. CEY: You are known for your iconic children’s designs that are fun and classic at the same time. Where do you get your ideas from? Jil: I think my biggest influence is the grown up fashion world. I adapt design details for my easy to knit silhouettes. My color influences are from the art world. I think so often designers design down for kids; I like to introduce some sophisticated ideas in delicious colorways. CEY: The color palette for MinnowMerino and CottonTail are so bright and cheery. What makes you want to put a color into the rotation? Jil: I’ve always been drawn to richly saturated colors…my undergraduate degree was in painting, and my work was all about color. I was delighted to work with CEY on my yarn lines, where I could produce colors that are exactly right for my designs. 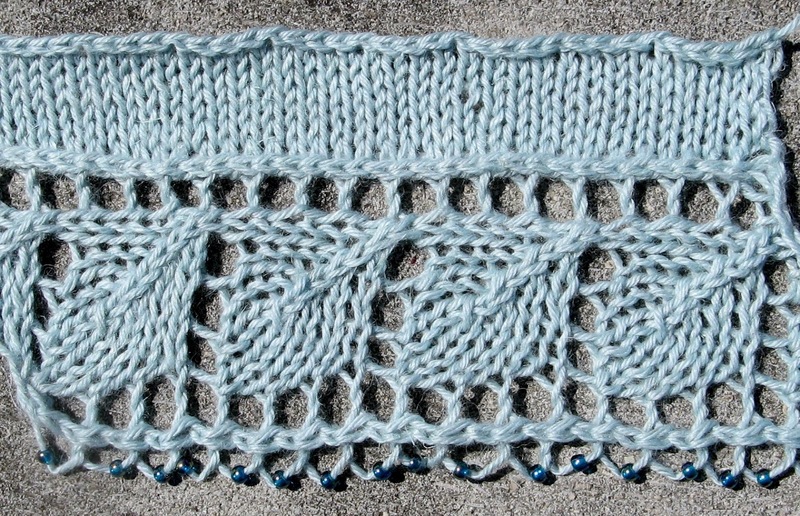 CEY: I noticed your new updated website and that you are now offering some of your patterns as PDFS on Ravelry. Jil: Yes, I have been working hard on getting my website redesigned. There are a line of Jil Eaton Classics available as pdfs, as well as Park AvenueKids and All Dressed Up as e-books, and you can find many of my single patterns on Ravelry as well. CEY: You write a column for Knit Simple called ‘Ask Jil’ where you help people with their knitting questions. If someone has a question for you, where can they send it to? Jil: You can send questions to jil@minnowknits.com. I love helping people with their knitting. CEY: What is currently on your needles? Jil: Right now I am working on lace swatches for a triangle scarf for my new line called Jil Eaton Studio, which will only be available on my website. 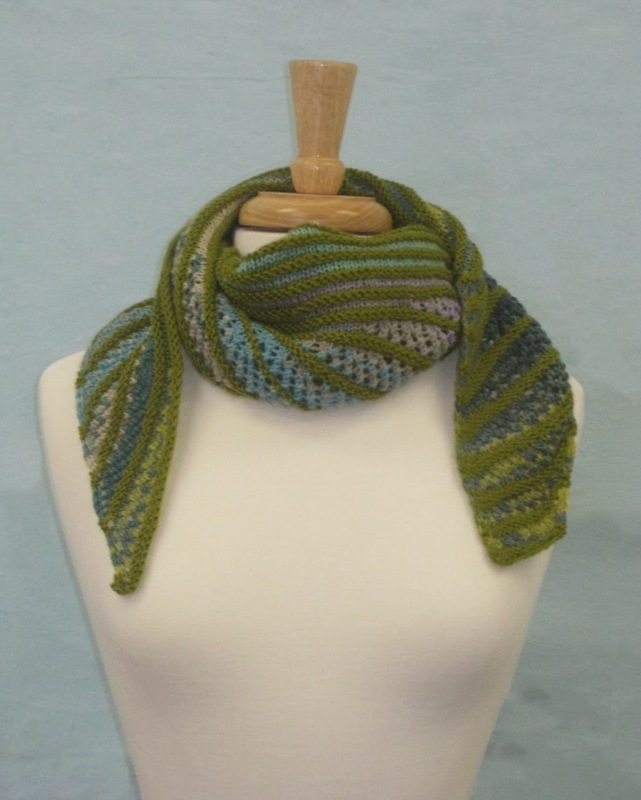 It will consist of simple projects such as scarves, cowls, mitts and other accessories, all my trademark QuickKnits, done in MinnowMerino and CottonTail. CEY: Thanks Jil. It was a pleasure talking to you! Make sure you check out all of Jil’s designs on her new website.